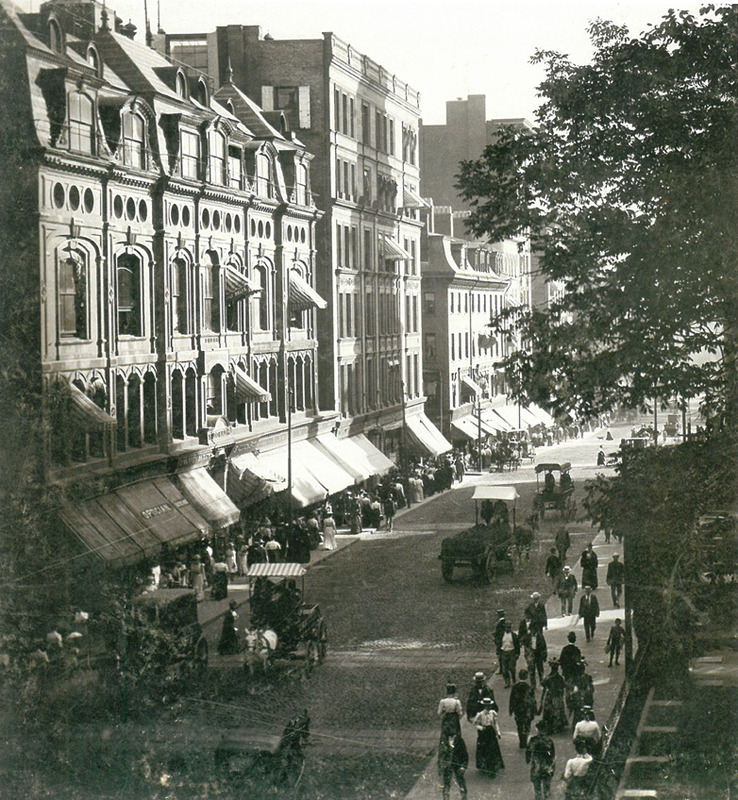 110 Tremont Street, Boston, from 1881 to 1897. The building is on the left in this August 1899 photo. Robert C. Vose's early career paralleled Boston's rise to the center of art in America at the turn of the century. He worked to promote his growing family business by broadening the gallery's horizons through the display of a fine stock of Barbizon, Dutch, English and American artists. Robert toured these exhibits throughout America while his younger brother, Nathaniel, and cousin, Charles Thompson, handled the busy Boston gallery with a new show every three weeks. Robert took his first exhibit across the country to Oregon for the Lewis and Clark Exhibition of 1905. Thereafter, he showed paintings by invitation in museums and in exclusive hotel shows. In the event of the latter, Robert would reserve a double suite in an agreeable hotel, clear the rooms of all furniture, and transform them into a gallery of over 100 paintings. As a result of his efforts, as well as a fine eye and aesthetic sense which Robert shared with his forefathers, Vose paintings now hang in almost every major American museum. As for his personal taste, Robert considered Adolphe Monticelli (1824-1886) to be the greatest colorist and initiator of the Impressionist technique, while he viewed John Twachtman (1853-1902) as America's greatest Impressionist. Robert often described his guiding philosophy in two lines from Keats' "Ode on a Grecian Urn:" Beauty is truth, truth beauty, and that is all ye know on earth, and all ye need to know!